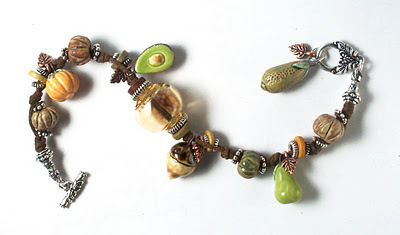 A few years ago, I wrote a post for Art Bead Scene about the things I was thankful for about my craft. This thanksgiving weekend, I wanted to reflect back upon that post. My beading has taken on a different form lately since I have been running a weekend booth at an artist market every week, so I am thankful for different things now, namely the opportunity to help others be creative with my crafty knowledge and encouragement. You can find my original thankful post in the archives here! If you have "glitter" experience, Lisa and her readers are looking for guidance when it comes to using glitter in jewelry projects. It's amazing how one's craft can open up new doors. Lovely bracelet! Melanie, I have not had much of a chance to see your new creations, but if the bracelet at the top is any indication, I LOVE it! I am planning some fabulous things this week with my new leaves, can't wait to use them! Thanks! Lol. So cruel! Deformed is not appropriate.